In its second major regatta win since arriving in Australia late last year the Corsair 760 won its division on OMR in the 2018 Moreton Bay Multihull Regatta held at the Royal Queensland Yacht Squadron last weekend. Skippered by current F18 National Champion Daniel Van Kerckhof, of Send It Sailing, the Corsair 760 sailed beautifully to finish with 2 firsts, 2 seconds and a third to win the regatta by a clear 3 points. This follows her debut regatta and win on OMR at Geelong Race Week earlier this year where she was skippered by Stephen Medwell and crewed by Greg Goodall and Michael Meehan. Designed by Francois Perus the Corsair 760 is not only a competitive race boat but also the ideal family boat for a weekend away on the water. Her large floats make her extremely stable even under sail and the updated interior comfortably accommodates 4 adults. 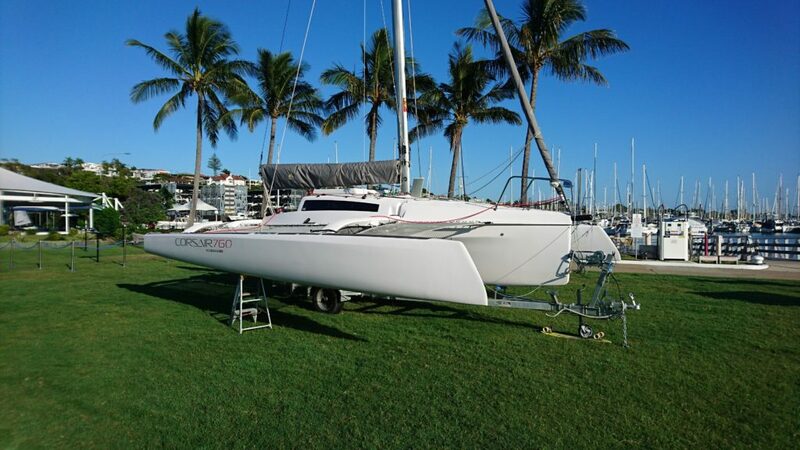 The Corsair 760 is currently available to view at the Royal Queensland Yacht Squadron and will be featured as part of the Multihull Central display at the Sanctuary Cove International Boat Show May 24-27, 2018. Also competing in the regatta were a small contingent of Seawind Catamarans. Taking out first place in their division on Performance Handicap were Andrew and Aida Stevenson on board their Seawind 1160 Lite ‘Double Black Diamond’ who won the regatta with a 9 point margin. They were followed in second place by Alan Hunter on his Seawind 1250 ‘Talisker’. Also winning their division on PHRF was the Seawind 1160 ‘Scarlett’ sailed by Craig and Kerry Margetts. For more information about the Corsair 760 or to arrange a test sail please contact Michael Meehan 0419 872 235 or michael@multihullcentral.com.